The community college is the largest single sector of the U.S. higher education network. As of 2005, 40 percent of newly enrolled undergraduate students attended community colleges. The American two-year school is a vast, rapidly changing, and under-studied institution. The aim of The Community College and the Good Society is tocritically analyze the internal changes and external forces that shifted the focus of the two-year college-from the liberal arts to job training. Chad Hanson raises a series of questions about what is lost or forsaken when public institutions become preoccupied with economic goals. When educational institutions turn their attention toward training workers to private-sector specifications, Hanson argues, our social and cultural lives suffer. He describes the "the learning college movement," an ideological framework that justifies the current emphasis on vocational training. In addition, he explores the implications of competency-based education, a philosophy and method for creating curriculum with strong support among administrators and boards of trustees. For more than four decades, a steady stream of commentary aimed at understanding the two-year school made its way into the literature on higher education. 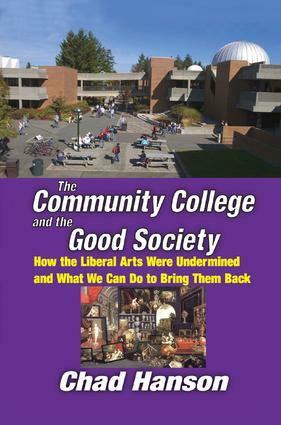 In this work, Hanson provides an alternative view of the community college. He offers suggestions for new teaching strategies, curriculum, and organizational structure. These changes will encourage the potential for the two-year college to flourish as an institution that provides a permanent place for the arts and sciences. Introduction: What are Community Colleges For?